The new Community Health Improvement Plan is here! The 2019-2022 CHIP was officially rolled out on Jan. 18, 2019 at SourcePoint with numerous community leaders and partners in attendance. 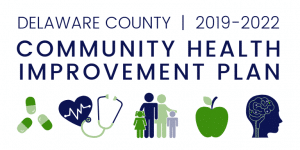 We invite you to check out the new CHIP including a multimedia toolkit to help you spread the word about the plan aimed at helping Delaware County #GoHealthy! The Partnership for a Healthy Delaware County page includes additional information about the plan.